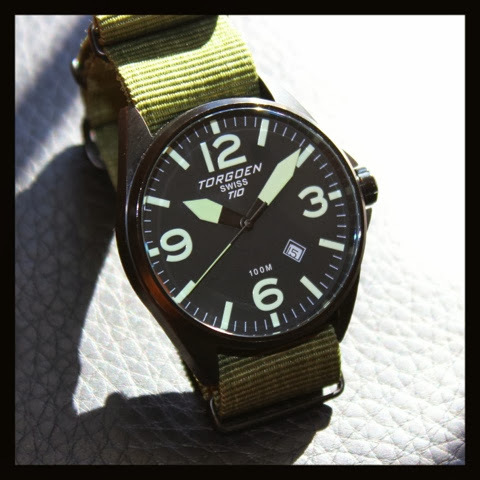 According to their website, New Jersey based Torgoen watches are made by aviation enthusiasts, for professional pilots. This is perfect, because The Time Bum needs a proper aerospace instrument to check the departure time of his connecting flight when sitting at an airport bar. The fact is, few of us really need a pilot's watch for piloting, but the aviation look can be appreciated just as easily from the ground. It is a clean and functional aesthetic that Torgoen has incorporated in all of its products, including the striking T10. 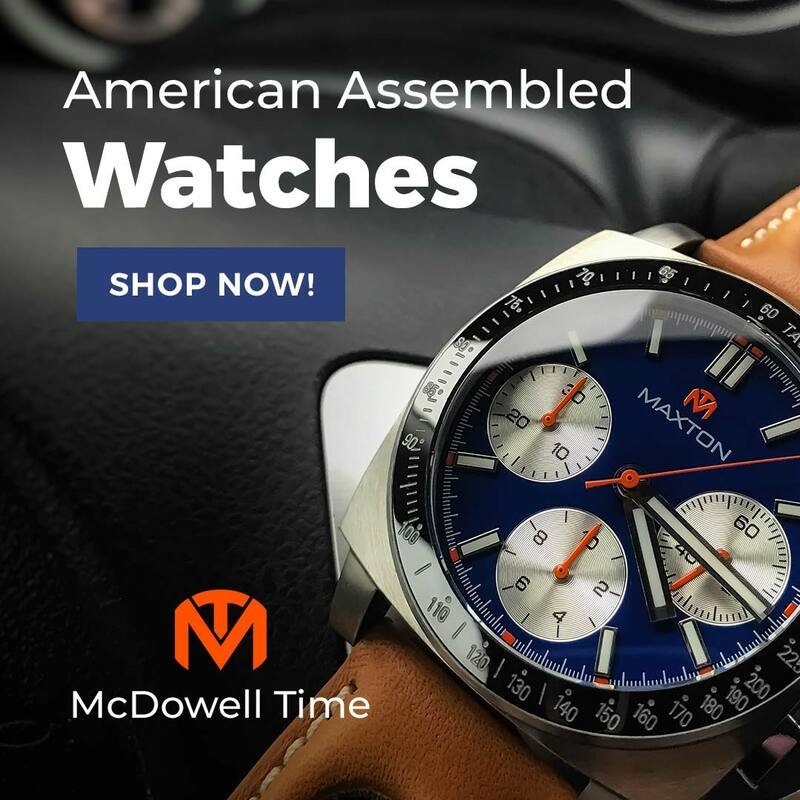 With a retail price of $305, the T10 is among the most affordable watches in Torgoen's line up. A Ronda 515S.2 quartz marks the time. It is an inexpensive unit, but it does the job. The second hand does not hit its markers, but at this end of the quartz market, that is to be expected. The T10 pairs an aircraft instrument style face with a conventional round case, eschewing the square case and exposed screws popularized by Bell & Ross, and shared by Torgoen's own T26 and T27 series. The T10 is available with black or cream colored dials, brushed or black PVD stainless steel cases, and on a bracelet or a variety of straps. I chose a simple black dial with white markers, in a black case, on a rubber strap. Measuring 45mm in diameter, and 52mm lug-to-lug, the Torgoen T10 has one of the largest cases in my collection. The huge 40mm dial and large numerals make the most of the size, yet the watch is in no way bulky. The black expanse fills my 6.5" wrist, but does not overwhelm it. This is due in large part to its relatively modest 14mm height, and the curvature of the lugs. The proportions are attractive and quite wearable. The case back is polished and etched with an aircraft design. Oddly, there is a large blank area below, possibly for a customer's own engraving. 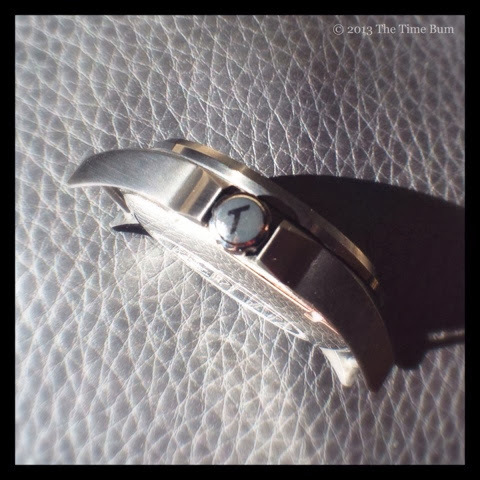 The watch has a flat mineral crystal. A 3:00 crown is flanked by guards and bears the Torgoen "T". 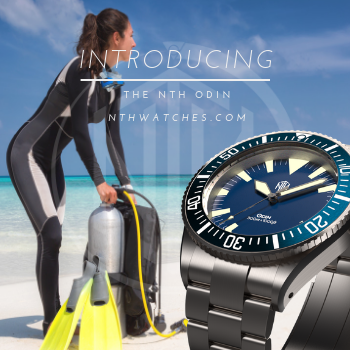 The watch is rated for 10 ATM water resistance, making it useable for daily wear, and perfectly safe for swimming. One of the hallmarks of a pilot's watch is legibility and the T10 excels in this department. The layout is simple and uncluttered with large Arabic numerals at 12, 3, 6, and 9, similarly sized hour markers in between, and fat white sword hands. It is a classic pilot/instrument look. The elements fairly jump off of the flat black dial. The text on the dial is kept to a minimum and well positioned with "Torgoen Swiss T10" under the 12, and "100M" above the 6. The only element breaking this symmetry is the date window. While I believe the design would have been greatly improved with its omission, the black on white date wheel is easy to read, sized in proportion to the markers, and by virtue of its 4:30 placement, does not interfere with the other elements on the dial. Legibility extends into the night as the markers and hands are painted with luminous material that glows brightly and lends only a slight greenish cast the to white in daytime. The rubber strap is sturdy with curved ends that fit snugly to the case. I am generally not a fan of rubber, but I found this one to be quite comfortable. It is a long strap, measuring 130/90mm, which is the very limit of what will fit my 6.5" wrist, and with a bit more tail than I like, but it fits. Those with slightly larger wrists will have no such problem. 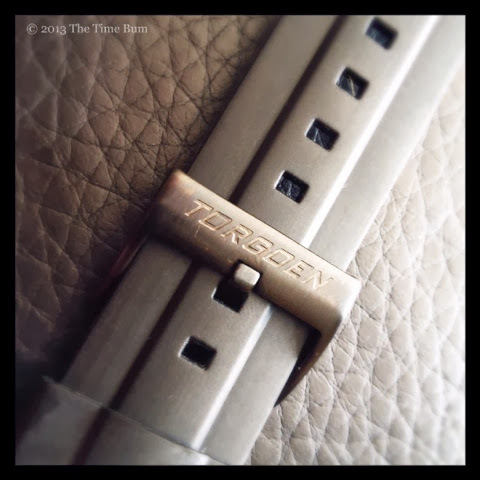 It tapers from 24mm to a 20mm PVD buckle bearing the Torgoen brand. I like this touch, but the strap also has "TOR" "GOEN" in huge letters on each half. I understand that it is important for a brand to be visible, but this is a bit much. Fortunately, there is no shortage of interesting 24mm straps in the world, and the basic black and white T10 wears them very well. The only drawback is the rather tight spacing between the case and the spring bars, which precludes any fat straps, and requires removal of the spring bars for anything thicker than a standard nylon NATO. About 2mm at the spring bar (not the thickness of the body of the strap) is the maximum, and that is a bit of a squeeze. 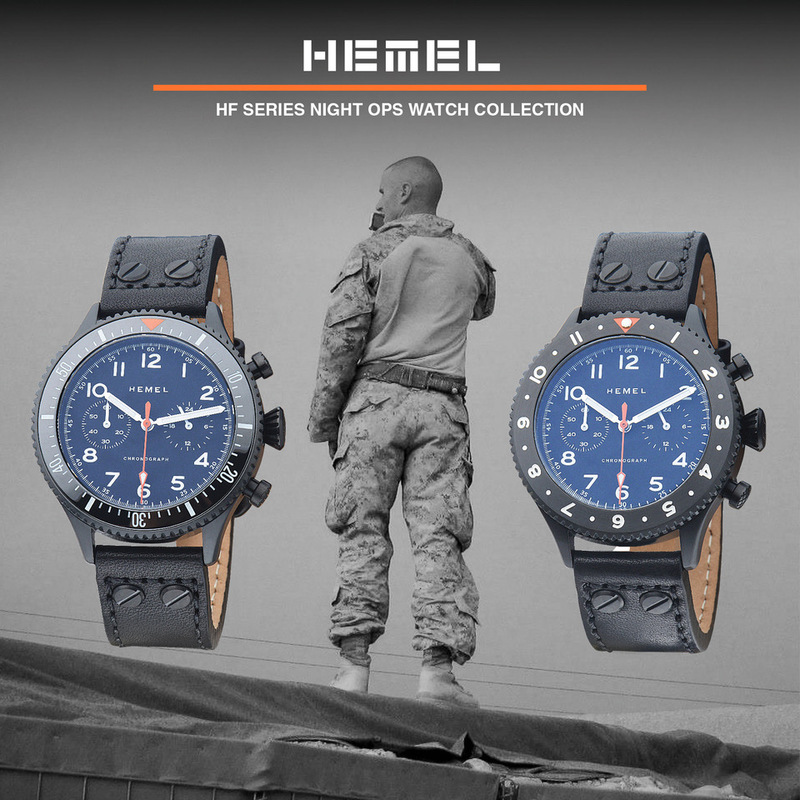 The military look of the watch makes it a natural fit for military inspired straps. A dark green nylon NATO with black hardware from Clockwork Synergy did the trick with the added bonus of playing nicely off the greenish cast in the markers. 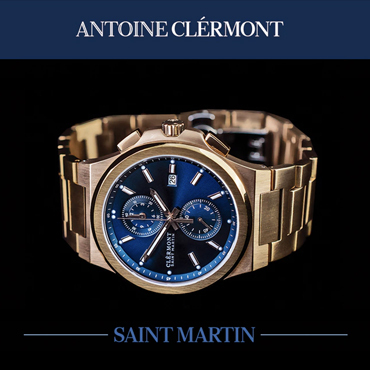 So we have a large watch with a very appealing design that wears comfortably on my relatively small wrist. I have owned it for some time now, and it has served me well, with only a few nicks in the PVD finish to betray its age. Would I recommend it? Maybe. 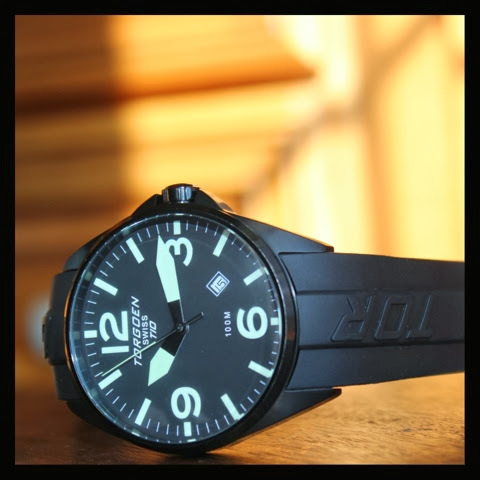 I like this watch, I really do, but I paid $120 for mine from an aviation supply company. That was a good deal, $305 retail is not. If you are willing to pay over $300, you can find some rather interesting pilot watches, like those offered by fellow fight enthusiasts Gavox and Techné. Head over to G. Gerlach and you will find aviation themed models with automatic movements and sapphire crystals for the same price. It makes it hard to justify paying the same for a rather mundane quartz with a mineral crystal. On the other hand, if you can find a T10 on sale for under $200, perhaps closer to $150, it becomes much more appealing. Con: A bit steep for what it is. Sum: Recommended, but only if it's on sale.